FORTAL has developed a range of stepladders to meet the requirements of everyday maintenance operations on all type of aircraft (planes and helicopters). 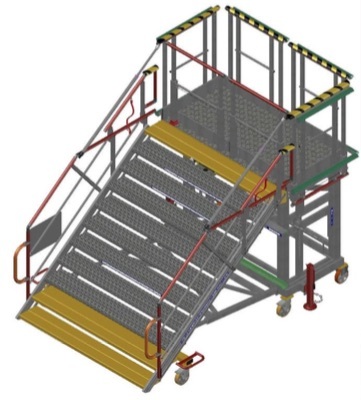 Our runway stepladders are highly resistant to corrosion and maintenance free. Anti-slip ribbed flat sheet aluminum platform size: 2060 x 1000 mm Independent sliding guardrails handled by a single person from floor. To view the full specifications click here.